Interview with Rick Terlep and Earl Poteet (The Crew) conducted July and August, 2009. Rick Terlep was having a hard time recording a song he had written, “Mickey One.” The band he had put together to record had “issues” and fell apart almost as soon as it was formed. So Earl and Rick went with Plan B – start over. Both Terlep and Poteet had already established themselves in the local Pueblo band circuit – Terlep with The Crooks, and Poteet in the polka outfit, The Chuck Spurlock Band. With Poteet on lead vocals, and Terlep on guitar, the two recruited Alfred Sanchez on drums, Brain Police member Phil Dirt on bass guitar, Dave Carleo on keyboards, and John Grove on backing vocals. Terlep got the idea for the single “Mickey One” from a Warren Beatty gangster movie. “I never saw the movie but I knew Mickey One was a cool guy,” he admitted. 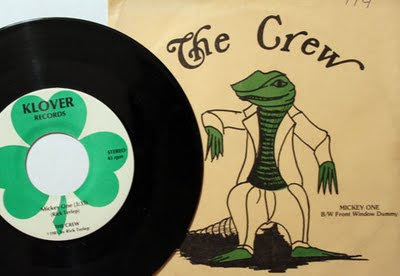 The record was put out by Terlep’s own Klover Records, in 1981. “There was an article in the Pueblo paper about some St. Patrick’s Day event here. The holiday is pretty big here in Pueblo, and at the bottom of the story there was this shamrock. I thought that could be cool for a record label, but there was already a Clover Records, so I ended up spelling it differently.” The Wheatridge Drive address on the label was to his own home. The flip side, “Front Window Dummy,” was written by Terlep and Mike Green. “Mike was mad because he had broken up with his wife and he didn’t like the dating scene, because the thought all of the women were phony and plastic,” said Terlep. "Mickey One" went on to become the "Pepsi Pick of the Week” on local station KDZA. “They played two records and the other one was some nationally-known artist. The one song with the most calls won,” said Poteet. “We were on pins and needles because here was our song being played on KDZA.” The distinction meant that the song would go into heavy rotation on the station. "For whatever reason it didn’t," Poteet said. “I think the station thought we jammed the phone lines with our own people, but we didn’t." In the process of promoting "Mickey One", Poteet and Terlep approached Jay Ritchie, a disc jockey on KIIQ, based outside of Colorado Springs. Ritchie hosted a program called “Band on the Run,” featuring local up and coming acts. While "Plant People" received airplay during the KIIQ broadcast, it also caught the ear of Dr. Demento, who played the song on his nationally syndicated show, August 1, 1982, sandwiched in between the premiere of “Hey E.T,.” by Dickie Goodman and “There Was a Fungus Among Us,” by Terry Nolan. “We also submitted another song called “Computerville,” but that didn’t actually air on the Demento show,” said Poteet. Shortly after the release of the record, Terlep left the band for a guitar conservatory in San Antonio. Poteet quit music to work as a high school teacher, and later a longtime radio personality on KDZA, Wallace Cotton. "I would also go on to have a seven-piece R&B/funk band named Wallace Cotton & The Royals that would play together from around 1990-2003, and had a huge regional following," said Poteet. Terlep returned to Pueblo to join Brodie White and White Noise, and in 1994 he recorded a solo CD, Electric Silence. It was released in 1997. "I actually had the pleasure of singing the first version of the song," said Poteet. "It was right before I left the band. Anthony took over the lead vocals and did a great job with it." 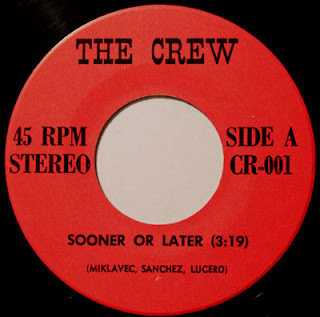 The Crew went on to play around southern Colorado for several years, before disbanding. Head south out of Pueblo, turn right at Walsenburg, and you’ll come to La Veta, Colorado—population 882. Situated on the eastern side of La Veta Pass through the Sangre de Cristo Mountains, at the northern opening of the Cuchara River Valley, you’d never expect to find one of the kings of square dance callin’ – Marvin Shilling. 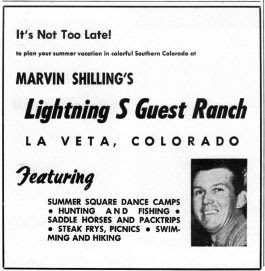 Shilling ran the Lightning S Guest Ranch in town, a popular tourist destination for city slickers wanting to play cowboy. The facility also served as a Huerfano County hot spot, with dances held throughout the year. A savvy businessman, Shilling recorded not only himself, but close to 20 different callers on more than 60 records on his Lightning S label. Listen to "Rocky Mt. 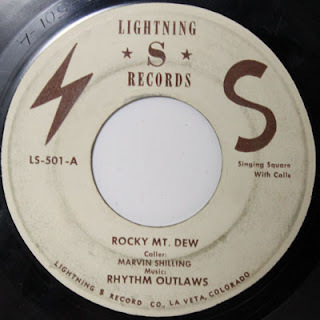 Dew" - Marvin Shilling and the Rhythm Outlaws. The June, 1960 issue of Bow and Swing describes "Rocky Mt. Dew" as "a singing call, with a continuous do-paso ending in a promenade with the right hand lady." He sold the record for $1.45. While Colorado was Shilling’s home base, he would regularly gas up his private plane and fly himself to dances across the country, where his calling was always in demand. 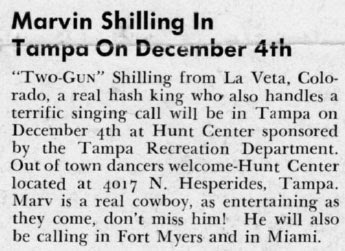 Shilling died October 25, 1962 when the plane, of which he was piloting, crashed while on his way to call a dance in Nebraska.